Riverside Park in Manhattan is lined with London Planetrees. The London plane, a cross between the American sycamore and the English Oriental plane, is the king of street trees. It is the world’s favorite urban tree because it is tall, big-leafed, hardy and long-lived. Although they may get a bit messy, London planes are by far the most common tree in London, Paris, Rome, and New York City thanks to their unparalleled ability to filter air pollutants. Princeton Elms line Pennsylvania Avenue outside the White House. Almost every city and town in America has an Elm Street (we have one in Northwest AND Southeast), so it is no surprise that the American elm was once the most common street tree in America. In the 1930s, Dutch elm disease decimated populations. 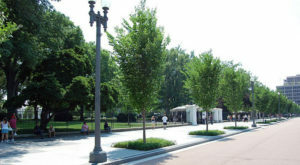 Disease resistant cultivars like the Princeton Elm, have recently been popping up – including in front of the White House. A Little Leaf Linden at the intersection of New York Ave and 11th Street. 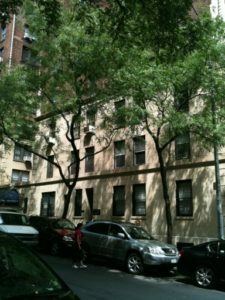 Thanks to their fragrant flowers in June, the American linden and the little leaf linden are among the loveliest street trees. American lindens originally lined Massachusetts Avenue during much of the nineteenth and early twentieth centuries. 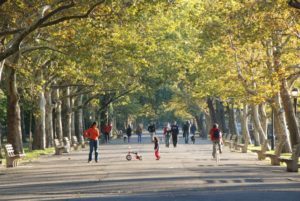 Recently, plantings by the Urban Forestry Division and the work of the nonprofit group Restore Mass Ave have aimed to restore and protect the historic integrity of the American linden along the avenue. 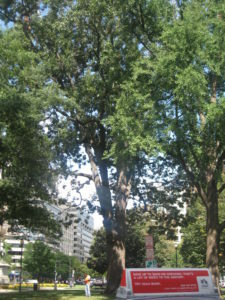 A Northern Red Oak in MacPherson Square, in downtown D.C. The northern red oak displays a rich red color in the fall, right. Strong-limbed, it is an excellent street tree that can tolerate difficult urban conditions. In the fall the leaves turn to a distinctive bright brick red. You can find red oaks in a lot of places in D.C. including McPherson Square, Cleveland Park, Dumbarton Oaks, Logan Circle and Woodland-Normanstone. 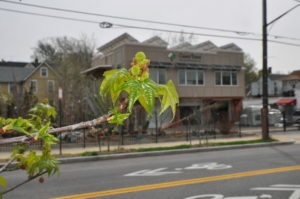 A Sweetgum outside of the Casey Trees office in Brookland. If Alexander Hamilton had his way, the sweetgum would have become “America’s emblematic tree,” and although it is perhaps unfortunate that the sweetgum did not make it into the same exclusive club as the oak, it remains a popular and prized tree wherever it’s found. The sweetgum displays a wide variety of fall colors, from yellow to bright red to purple. A street lined with Honey Locusts. The honey locust has an open branch structure and tiny compound leaves which create very light shade. During the summer the leaves are rich green color, but in the fall they turn to a deep golden yellow hue. Its fall color truly shows how it got its common name. Pin Oaks line Pennsylvania Avenue between the White House and the Capitol. Pin oaks are one of America’s most popular trees for big cities and suburban lawns. Unlike other oaks, they have one strong leader from which all the other branches grow. Perhaps one of the most abundant oaks in the United States, the pin oak can be found in almost all corners of the lower 48 states. 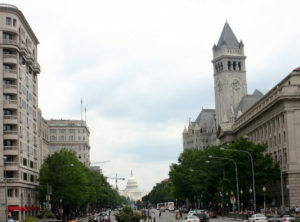 They even line Pennsylvania Avenue between the White House and the Capitol Building. Corcoran Street NW ginkgoes in fall. The ginkgo tree is known for a lot of things – its fan shaped leaves, its status as a living fossil, and the unfortunate smell of the fruit that female trees produce and subsequently shed. Even though they stink, Ginkgo trees are uniquely suited to survive harsh city life – not only can they hold their own against air pollution, but they stand strong in the face of soil compaction, pests, disease, salt, wind, cold, drought, fire, and even nuclear blasts. 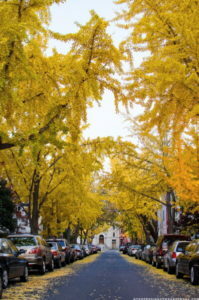 Thanks to their hardy nature, and no thanks to the females’ stinky fruit, there are still thousands of Ginkgo trees maintaining their majesty as woody angels of the Districts streets.